Lucky Charmer is a bonus feature slot by Microgaming. It has a fixed coin size of 1.00 and a max bet of three coins per spin. Top jackpot on the reels is 5,000 coins and you can win up to 2,400 coins on the snake charmer bonus feature. Lucky Charmer combines the excitement of a classic three reel, single pay line game with the added fun of a second screen game. It comes with a fixed coin size of one dollar and requires a three coin maximum bet to qualify for the bonus. We highly recommend playing max bet on every spin. There are seven symbols on the reels. A green cobra, a flaming seven, three bar types and a chilies. There is also a king cobra that only appears on reel three. The top jackpot is 5,000 coins for three cobra symbols on the pay line. The king cobra is wild for the green cobra but no other symbols. Landing the king cobra on the pay line awards the bonus game. You get to see a snake charmer with a range of pipes (View Bonus). Select a pipe and the charmer begins to play. The baskets then reveal items. The items determine the bonus win and range from 5 coins to 800 coins. The maximum bonus game win is 2,400 coins if you get all three cobras out of the baskets. 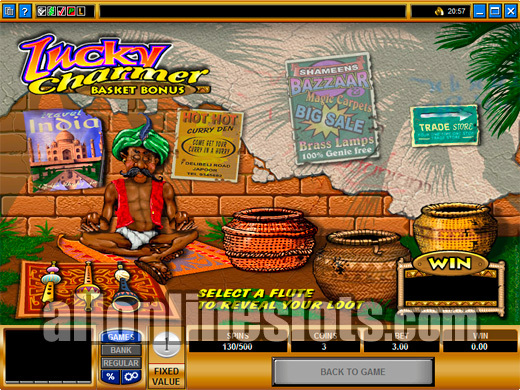 Lucky Charmer has a great range of high to mid level pays on the reels. Three flaming sevens pays a nice $1,200 while three triple bars awards $600. Interestingly enough there is no any bar pay which is a little disappointing as this is one of the most commonly hit combos. The chilies make up the bottom three pays ranging from 3 to 30 coins. 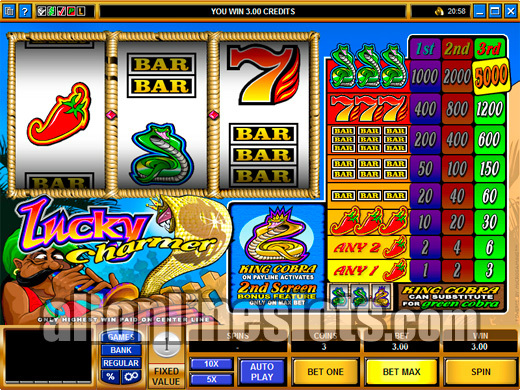 Lucky Charmer is an entertaining game to play and offers some great jackpots. If you are a fan of classic slot machines and are looking for something with a twist the Lucky Charmer might just be the game for you.